KNOWING one’s purpose in this world helps one change for the better. Performed in the Albertus Magnus building and produced by Mediartrix, Alunsina is a musical written by Rachel Hester and Marty Agustin and directed by Monica Divino. It retells the Visayan myth of Tungkung Langit and Alunsina and adds a twist by mixing the modern era and the folklore through playing with the idea of deities living and interacting with people on earth. The story begins with the impending danger brought by the evil god known as Panlinugon who starts causing natural disasters around the world and is planning to raise chaos in the Philippines through corrupt means. The deities above, who are losing their powers because of the slow deterioration of the people’s belief in them, are fearing the outcome of Panlinugon’s actions and decide to consult with their king, Tungkung Langit, about a prophecy that could stop the evil god. Meanwhile, Alunsina continues to live in hiding. She stays on earth and poses as a teacher. She is oblivious to the situation until she is informed by her friend and hand-servant, Tibang-Tibang, about the plans of Panlinugon. With the Philippine mythology set in the modern time, the musical finds a way to humanize the deities in a manner that helps viewers relate to and understand their motives and actions. This is greatly exhibited by how, throughout the play, Alunsina continuously doubts her capabilities and purpose due to the challenges she faces. 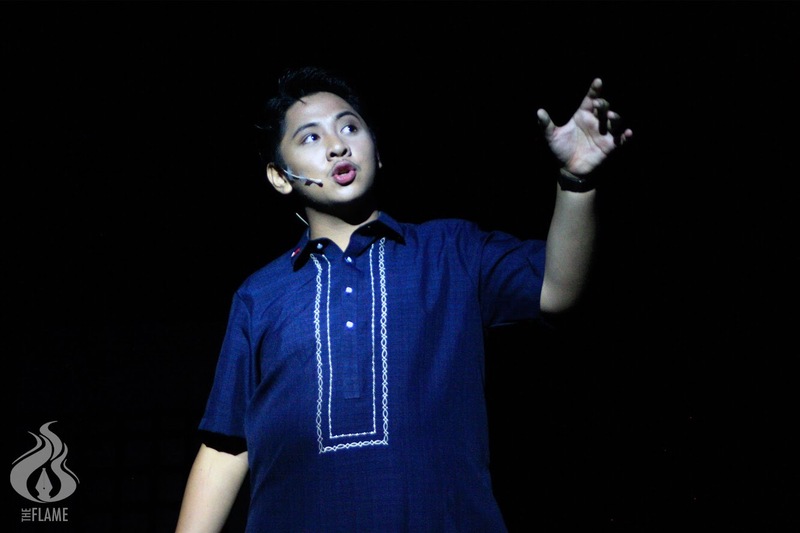 The musical also urges its audience to contemplate upon Panlinugon’s motivations, the root of his hatred for mankind, and his desire for destruction. Due to the fusion of myth and reality, the musical presented many sub-plots that were unfortunately left unexplored and unresolved by the end of the story. The focal point of the plot was also unclear as it left the question of what is really important in the play: the gods and how their presence and existence is dying because of the loss of people’s belief in them, the presentation of Alunsina as a symbol of female empowerment, or the philosophical question of whether or not humanity is worth saving after all their decisions and actions which have led to the planet’s slow deterioration. As a result, the play gives the impression of being rushed and unprepared, story-wise. There were also moments of technical difficulties in the sound system. This affected the singing performance of the actors, which made the delivery of the songs ineffective at times. This also impacted the dialogue exchanges between the characters, which became hard to hear from afar. The highlight of the musical lies in the actors’ portrayals of their characters. The traits of the characters that they want the audience to emulate were shown through every expression and every movement that the actors made. Though there were scenes where it seemed that some of the actors had forgotten their lines, nobody broke character. Even the side characters were intriguing to watch as they added an extra flair in each scene. The set design was also noteworthy, switching from fantasy to reality depending on the scene. The unique setting of the story was also greatly exhibited by the precolonial costumes worn by the actors. These factors are further enhanced by the lighting and the choreography of the actors. Alunsina’s character is the pinnacle of the musical. The fictional character’s role and the actress’ singing ability shone in almost all parts of the musical. She was also especially convincing in the scene where she and the antagonist were having a presidential debate. Throughout the play, her character develops from someone who tries to avoid conflict and consistently doubts her own value and capabilities, to someone who knows her purpose and is fearless enough to stand for what she believes in. This was manifested in a scene where she decided to stay on Earth to protect mankind rather than stay in the heavens with her husband, Tungkung Langit. Overall, Alunsina was not able to hit the mark when it comes to plot, but it teaches the viewers the importance of knowing one’s purpose and being strong enough to commit to it. By the end of the musical, the image of Alunsina standing among mankind, guiding them to a better future, becomes a testament of her journey to self-discovery and self-empowerment.